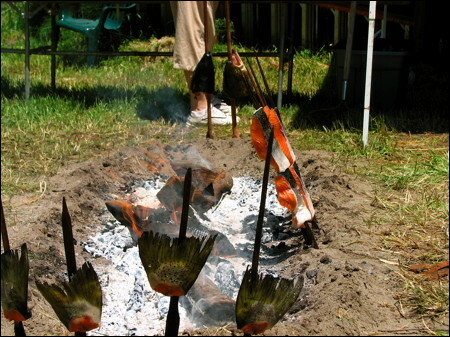 On June 4, 2007, the Sacred Salmon Ceremony came home to the Takelma village of Ti'lomikh, along the Rogue River in southern Oregon. This was the first time the ancient ceremony was held in its original location in over 150 years. Takelma elder Agnes Baker-Pilgrim was the Keeper of the Sacred Salmon Ceremony. The day included divers returning the bones of the first salmon to the bottom of the river near the falls, native stories told on the river bank, traditional drumming and singing and a salmon feast.